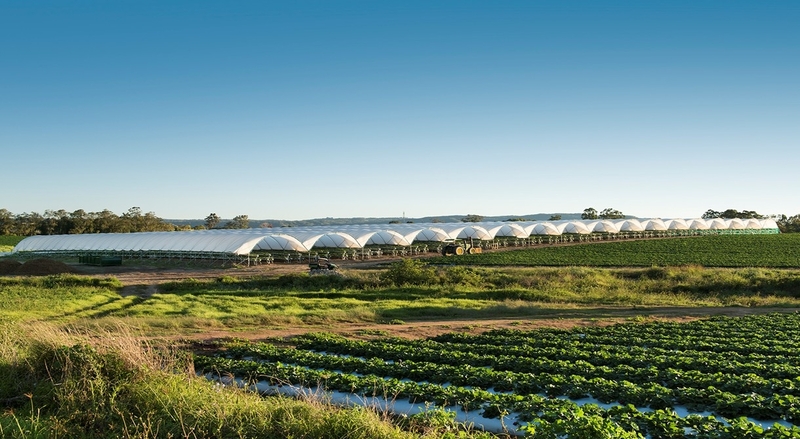 A portion of our 45-hectare strawberry operations at Wamuran has been reserved to grow specialty strawberries under polytunnels exclusively for our joint venture company, BerryWorld Australia. Specialty strawberry varieties – selected for taste and appearance attributes from our joint venture partner BerryWorld Group’s breeding program in the United Kingdom and Spain – are grown under polytunnels to mitigate weather events. Because strawberries are such a delicate fruit, protected cropping shelters strawberries from wind and rain and keeps them at a consistent temperature, no matter what the season. Under polytunnels, strawberries grow in traditional beds and in substrate – coconut coir growing material – on table tops. In both methods, the beds are covered in plastic sheeting to contain the plants. Strawberries in beds on the ground are watered by sprinkler while those on table tops are watered by emitters. Come harvest time, pickers use waist-high trolleys made on the farm to hand pick ripe fruit. Wamuran’s BerryWorld strawberries are produced between May and October.